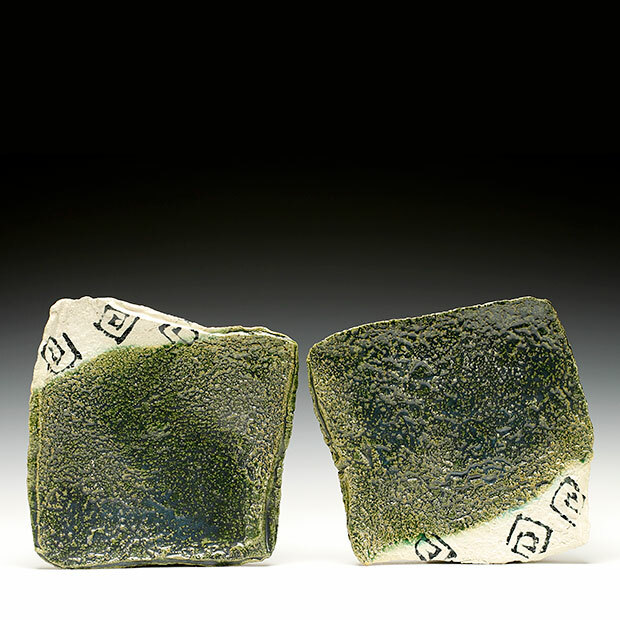 Set of two with oribe and clear glaze, decorated with brushwork and oxidation fired. Having spent 7 plus years living in Japan, the experience fundamentally and profoundly changed not only my work, but my outlook/view on life, and this is further reinforced with my continued work in my studio in Seattle Wa, as well as my yearly trips back to Japan to recharge and absorb. While in Japan I was making primarily works for the table and as such I became keenly aware of the interaction between serving piece and the food that it contained. Form and function were paramount as well as weight and balance of the ware due to the fact that many of the pots were held in the hand while eating which generally is a custom that we don't have in the West. Along with this was color, and after a number of years working there, my color palette gradually came to focus on the extremes of the color scale, black and white. As well, when venturing into Tokyo from my countryside studio, I often found myself in a wonderful calligraphy museum located in Uneo Park, where I would sit in silence looking at the work as well as taking respite from the cacophony of Tokyo outside. These experiences would have a strong influence of my functional work which continues today as I find myself working in clays of black, deep brown, and white, utilizing white slip as surface decoration, and finally choosing a color palette of glazes that in base forms by themselves tend to be black and white. However when fired in a variety of atmospheres and temperature ranges, working the edges of their respective firing ranges, a variety of subtle colors can be coaxed from these few base glaze formulas. 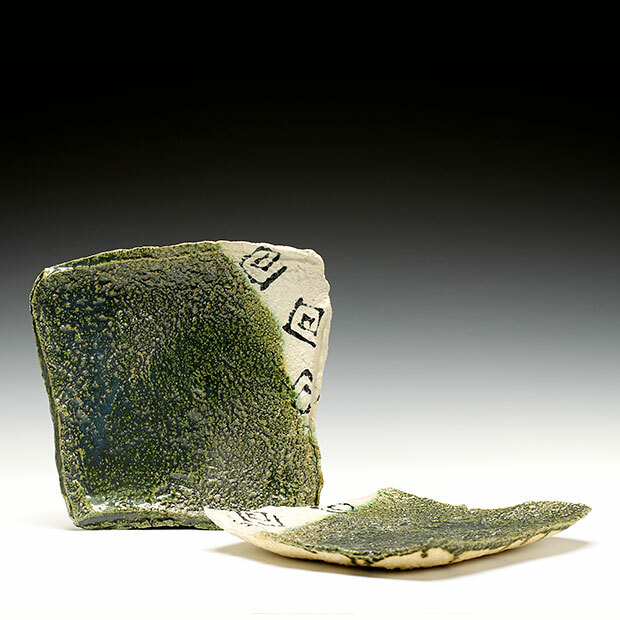 The work presented here, while small in scale, is an attempt to add a somewhat sculptural and intimate take on sake ware. 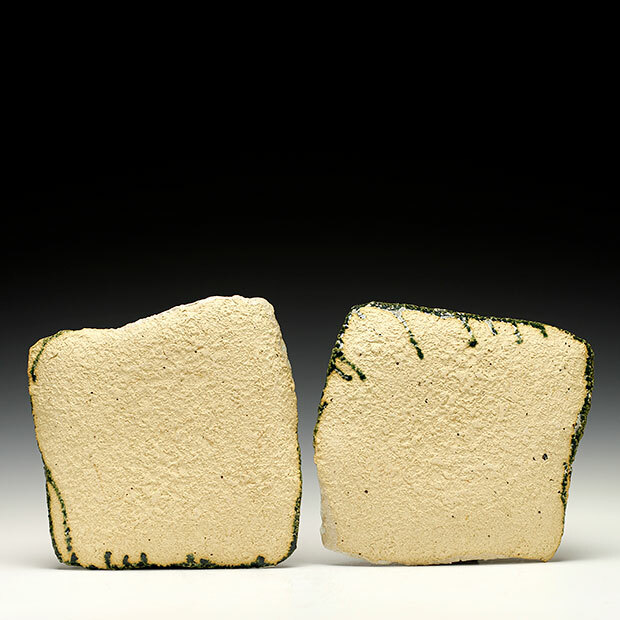 The kurinuki carved pieces place form slightly ahead of function and are an attempt to challenge the user to explore new ways of enjoying sake. There are fairly straight forward works as well i.e. 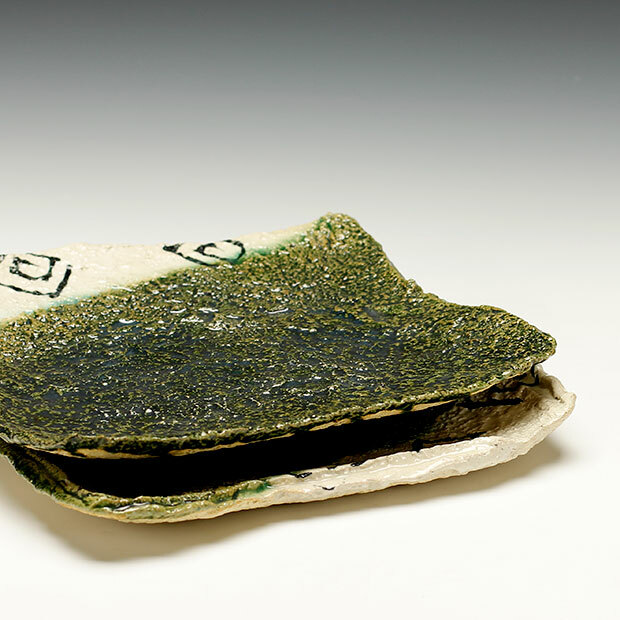 the Korean Buncheong inspired pieces, but also there is work, much like my sculptural ceramics, which has a story behind it as the case in the Fukushima series masu and the stamped Buncheong style plates. Working alone in my studio, my thrown work is either created on an electric wheel or, in the case of my tea ware, on an old momentum kick wheel. There is a certain pace to throwing on the kick wheel that gives a special quality to the tea bowls as they emerge one by one from the hump of clay before me. Clays I use in my work include a dark brown high iron body, a black body, as well as a buff body which when fired approximates the mogusa clay used for Shino ware in Japan. Local clay which I dig in the area is added in percentages ranging from 10% – 50% depending on the color palette as well as textures that I seek to achieve. The slip I use is sourced from eastern Washington. Additionally, I procure ash for glazes locally as well, using various types of ash including apple wood, black pine, and alder as depending on the type of tree or plant and where it grew, I can achieve differing color and surface quality. The work is either single or multi-fired fired here at my studio to cone 7-9.